We are identified as one of the leading names in the market engaged in providing a wide range of Tie Rod Plates to the clients. Dimension: as per Railway Standard Drawing Basis. We Manufacture Tie Plates are rolled, machined, forged or casted. 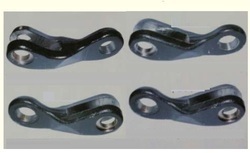 Tie plates may be of various formations and can be used with different type of fittings. Tie Plates are fabricated from hot-rolled steel sections which are punched and sheared to size and are available in single or double shoulder design. Most comply with IRS, GOST, AREMA and llIC standard, new development in progress to meet most track requirements. Tie Plates are fabricated from hot-rolled steel sections which are punched and sheared to size and are available in single or double shoulder design. we ar the manufacturers of railway tie plate..